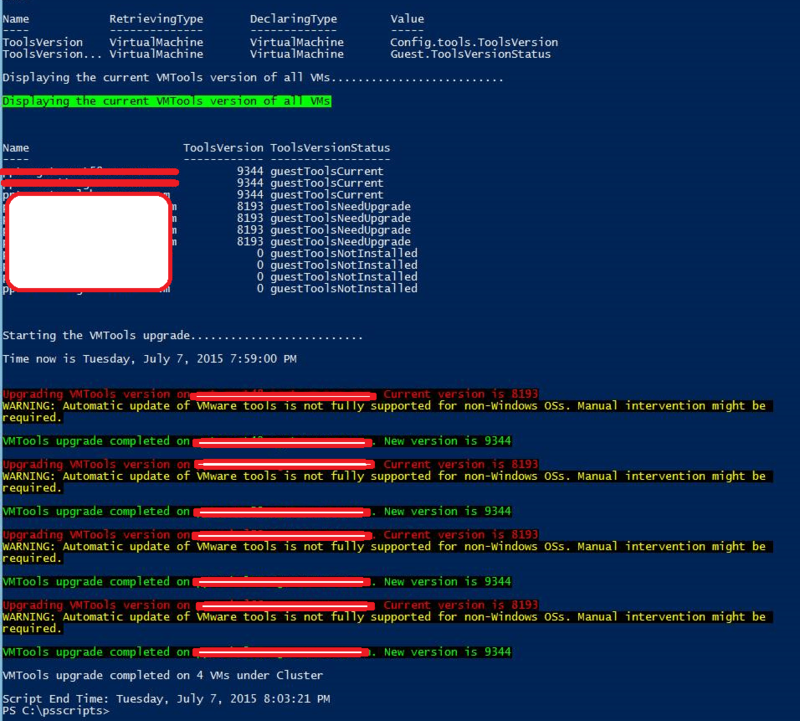 Mass Upgrade Vmware Tools – Hey Guys, here’s a cool way you can upgrade VMware Tools across all your VM’s managed by by vCenter, and all this using PowerCli, no more logging in manually to each and every 100’s of VM’s and executing the task manually. The script assumes that you have a VISession already established to your vcenter server. Or the best way is to code it in your script / function itself by passing the $vcenterserver and $credential as parameters. So once we are connected to the vcenter server, lets start building our script, i have broken down the function with detailed explanation. Write-Host "`nEsx Cluster Name $Cluster_Name.........................."
# Saving list of VM's that have current version of vmware tools into a notepad file. Write-Host "`nStarting the VMTools upgrade.........................."
Write-Host "Time now is $Current_time `n"
# An If Loop to check the VM's accessibility status and out it to a notepad file "Failed VM.txt"
Write-Host "`nScript End Time: $Current_time"
Once you execute the function you should see that all your vm’s tools are upgraded and you get a nice notepad file output with the results.